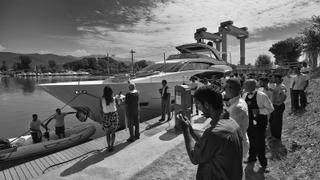 The 13th hull in Sanlorenzo’s entry-level series, the 24.6 metre Sanlorenzo SL78, has been delivered and named Barracuda. Sold by Sanlorenzo Spain to a Northern European client earlier this year, Barracuda was handed over to her owner earlier this month and has already arrived at her home berth in Puerto Portals, Mallorca. 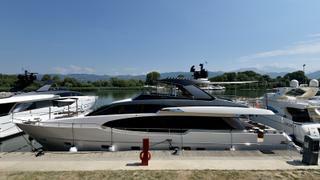 It comes after Sanlorenzo launched Balance, the 14th hull in the same series, last month. Balance will also be permanently based in Mallorca alongside Barracuda. Built in Ameglia to RINA standards, Barracuda features a four-cabin layout. All accommodation is provided on the lower deck with a full-beam owner’s suite, VIP stateroom and two twin cabins. Meanwhile, the crew quarters will allow for a staff of up to three people. The 3.95 metre jet tender will be stored in an aft tender garage and easily deployed using an innovative hydraulic launching system. The yard revealed Barracuda has been "carefully tailored" to meet the tastes of her owner, who plans to extensively cruise the Mediterranean over the next few seasons. A notable trademark of the SL78 series is its bright and inviting 70GT interior, developed in collaboration with Officina Italiana Design, and this model will be no different, with lowered bulwarks and large floor-to-ceiling windows. Power will come from the yard’s more powerful option — twin 1,622hp MTU 10V2000 M96L diesel engines for a top speed of 29 knots. Other superyacht projects currently under development at the Italian yard include the flagship Sanlorenzo 64 Steel, which is due to hit the water next year.